Shoulder pain includes any pain that arises in or around your shoulder. Shoulder pain may originate in the joint itself, or from any of the many	surrounding muscles, ligaments or tendons. Shoulder pain usually worsens	with activities or movement of your arm or shoulder. Certain diseases	and conditions affecting structures in your chest or abdomen, such as	heart disease or gallbladder disease, also may cause shoulder pain. Shoulder	pain that arises from some other structure is called “referred pain.”	Referred shoulder pain usually doesn’t worsen when you move your shoulder. Your shoulder is made up of several joints combined with tendons and muscles	that allow a great range of motion in your arm. Because so many different	structures make up the shoulder, it is vulnerable to many different problems. The rotator cuff is a frequent source of pain in the shoulder. 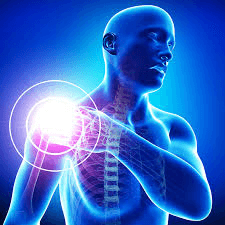 Tendonitis: The rotator cuff tendons can be irritated or damaged; Bursitis – The bursa	can become inflamed and swell with more fluid causing pain; Impingement	– When you raise your arm to shoulder height, the space between the acromion	and rotator cuff narrows. The acromion can rub against (or “impinge”	on) the tendon and the bursa, causing irritation and pain. Damage to the cervical spine can also affect the shoulder. Surrounding	myofascial trigger points may cause shoulder pain. Our integrated treatment options for shoulder pain, after a proper evaluation,	may include: PRP, trigger point injections, stem cell injections, extremity	manipulation and physical therapy. It is important to look at the whole person when evaluating a presenting	condition.